Vinyl is known for its durability and low cost. 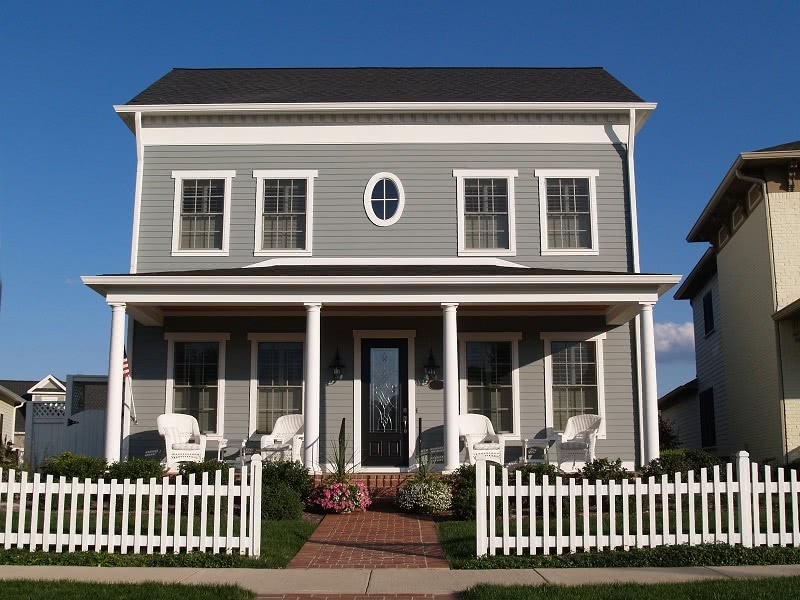 When deciding to re-side your home, it is the most popular siding material among homeowners to choose. 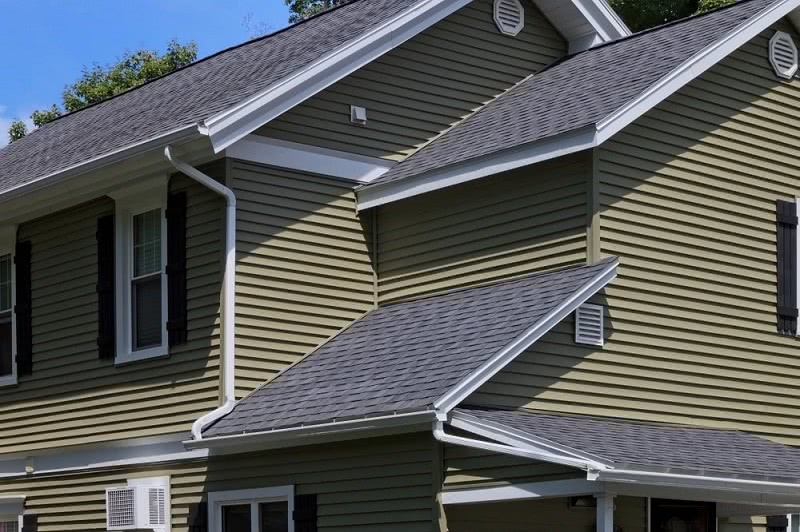 Vinyl siding is made of a thick firm plastic that is treated to resist rot and repel moisture. It gives you a protective barrier to your home’s exterior walls. Available in a variety of styles and made to mock other materials, you can attain any look imaginable by using vinyl siding. The main advantages are its low cost, easy installation, and low maintenance. Although the installation process isn’t too hard, it’s best when done by a trusted contractor. If you don’t want to take the risk of self-installation, Legacy Service should be your number choice in contractors for your siding project. If you are willing to take on the challenge we want to provide you with some tips on the best way to cut vinyl siding. The most important factor to a professional and uniform siding job is being able to cut the siding to fit your home. Even the slightest disparity will create a sloppy job and cost you money on repair in the long run. You may be wondering what do you use when cutting vinyl siding. 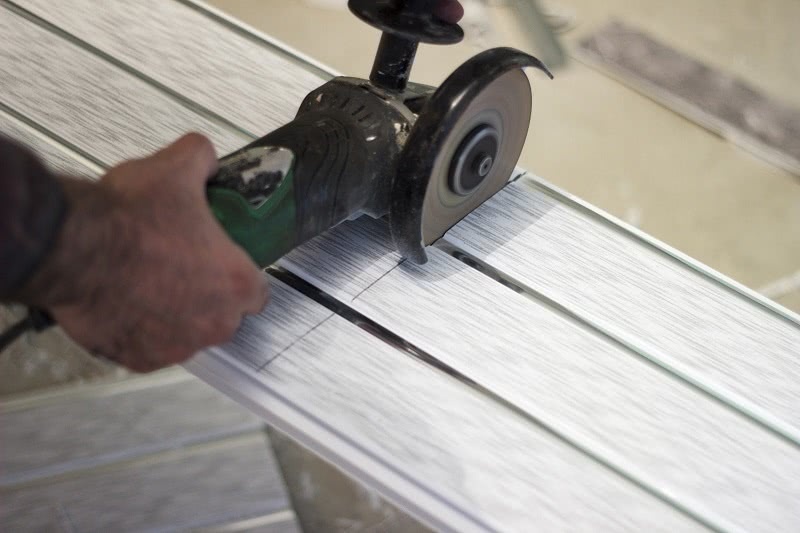 We’ll provide you with a detailed list of different tools and descriptions to help you avoid cracking and rough edges when cutting your siding. What is the best tool to cut vinyl siding? The tools needed for this project are pretty simple. A mix of hand tools and power tools can be used. When it comes down to which one is the best vinyl cutter, it may depend on your personal preference. Bench saws are a compact mounted circular saw attached to a stationary cutting table. 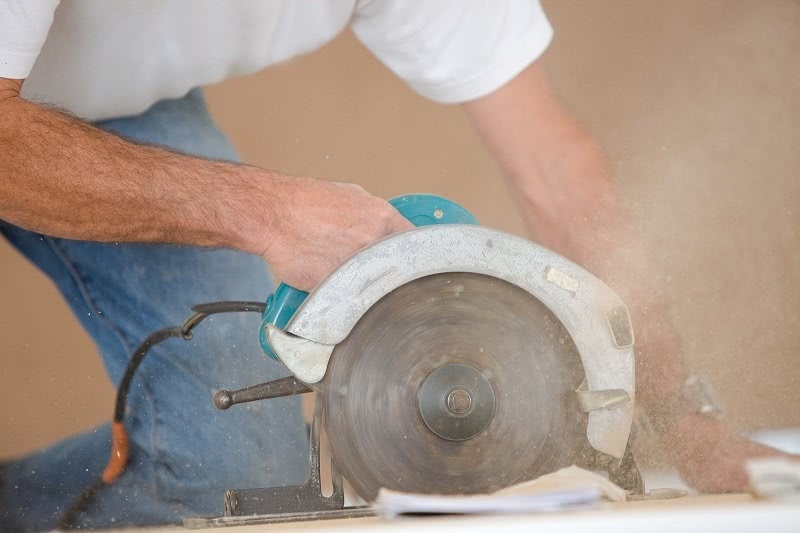 When cutting vinyl siding, the installer will most likely use a miter saw, radial arm saw, jig saw, or chop saw to produce detailed cuts through the planks. Because chop saws can only cut at a right angle, it is best to use a miter saw or radial arm saw for more complex cuts. 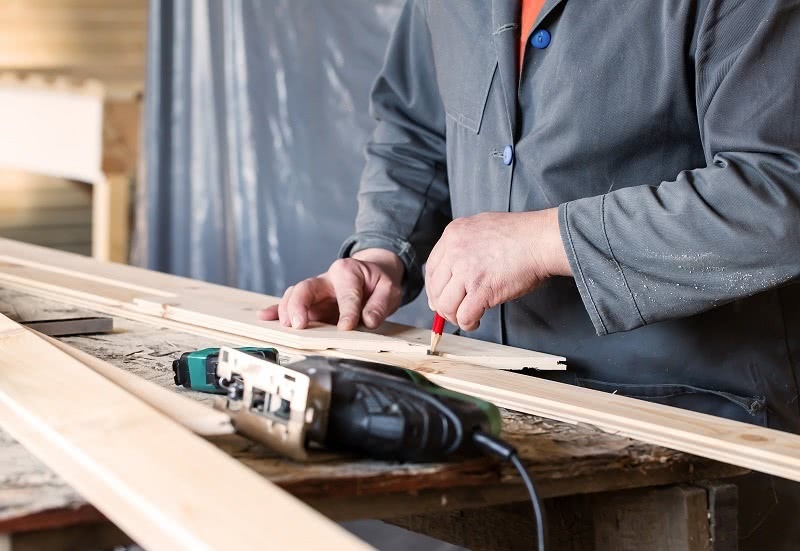 Despite which saw you decide to use, your bench saw MUST be fitted with a fine-toothed blade to give your siding the most precise cut. Installing the blade backward will give you a jagged free cut by melting the edges of the siding. Fine-toothed blades have the ability to cut through durable materials without burning, cracking or causing other types of damage. Handheld circular saws are perfect for crosscuts and rip cuts when cutting vinyl siding. They are lightweight, sometimes corded, sometimes not, and very portable. Its portability allows installers to easily transport the tool throughout different areas of their workspace. Most circular saws are able to get the job done when it comes to cutting vinyl siding as long as they are fitted with a fine-toothed blade. Tin Snips are the craftsman’s scissors in the construction world. 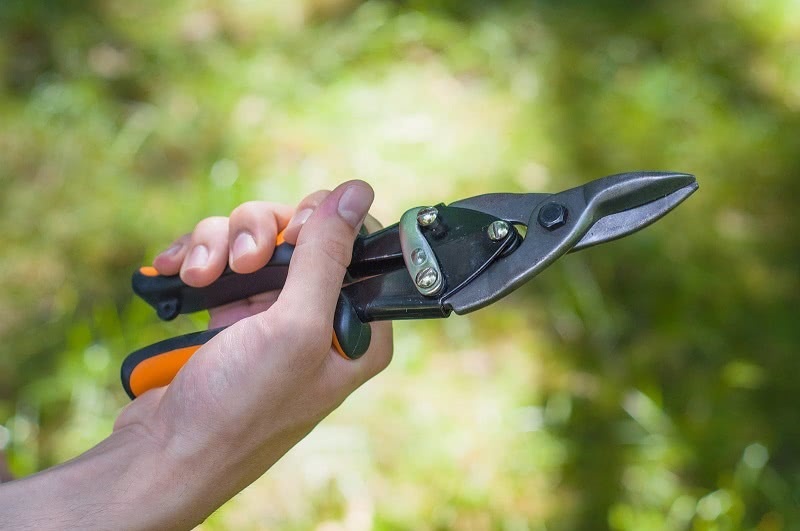 Mainly used for cutting soft metals, tin snips are also the perfect shears for easily slicing through vinyl siding. When using tin snips, installers can cut unusual and intricate shapes. Although they look common to household scissors, snips are much stronger because of their wedge-shaped cutting blade and compound cutting action. Sneak a look inside any craftsman’s toolbox and you’ll see a utility knife. Also known as a box cutter, this tool is great to have when an installer needs to make a swift and localized cut through the vinyl siding. Utility knives consist of a miniature blade that retracts into its palm-sized handle. The blade is controlled by a sliding button located at the top of the handle. This tool is great to have and very lightweight, versatile, and inexpensive. Although it may not serve as the cutters for vinyl, it comes in handy when trying to cut away small parts of preinstalled vinyl siding. Use a standard measuring tape to determine the amount of siding you’ll need to cut off. Measure the length of the wall that will be covered with siding, then subtract that measurement from the piece being cut. This equation should give you the exact amount of siding you have to cut. Make sure to measure around doors and around windows, not adding more siding than needed. It’s best to use a carpenter’s pencil when marking the line that will be cut. This will give you a very dark visible line that’s easy to follow as your cutting. To keep your siding in place, firmly hold it with your non-dominant hand as you are starting to cut. Make sure to grip it close to the marked line so there is no shifting while making your cut. Using the tin snips, slowly cut along the marked line. It’s best NOT to close the blades completely while cutting the siding. Slowly open and slightly close the snips across the vinyl until you are at the other end of the siding, this will give you a clean uniform cut. *Be sure to ALWAYS wear your safety goggles while cutting vinyl siding. Continue this practice on the remaining siding. Use the piece you cut first as a marker for measurements on the siding that still needs to be cut. Carefully measure the wall to determine the amount of siding that needs to be cut. Starting from the top, horizontally measure the segment of the wall that the siding will cover. Subtract that amount from the siding’s height, and that will give you the total amount of how much siding you will need to cut. For example, if the section of wall you’re covering is 5 inches (13 cm) tall, and the siding is 12 inches (30 cm) tall, you’ll need to cut off 7 inches (18 cm) from the siding. Use a carpenter’s pencil to mark a precise line where you will make your cut. This should be a vertical line running from one end of the siding to the other. Make sure not to rush when marking your measurements so you have a straight line. Set the vinyl on an even and flat surface. Putting your siding on a flat surface is important because it will help the siding stay in place as you’re cutting it. Using a workbench is the easiest way to do this. Lightly cut along your marked line with the utility knife to score the siding. Attentively follow this line while scoring until you reach the other end of the siding. Don’t worry about cutting completely through the siding since you’re only making a score line. Though you’re only scoring, it is still important to wear safety goggles throughout this process. Using both hands, you’re going to snap the vinyl siding along the scoreline. Do this by placing one hand on each side of the scoreline. Holding the siding very firmly, start bending the siding back and forth until it breaks along the line. If the siding does not break, try making another scoreline with the utility knife. For this method, you will need a fine tooth plywood circular saw. This type of blade will give you the cleanest cut and provide you with the best results when cutting your vinyl siding. If you already have a circular saw but not a fine tooth plywood blade, take a trip to your local home improvement store or even try shopping for one online. For most projects, the following tip is a bad idea, and pretty dangerous, but when it comes to cutting siding, it’s the best practice. We’re actually going to mount our saw blade on backward into the circular saw. Double check it by making sure the teeth of the blade are pointing opposite of the direction that the blade spins. Using this trick is essential to get a smooth clean cut. Use a carpenter’s pencil to mark a line where you’ll be cutting your siding. Make sure this line is dark enough to see as you are using the saw. If your siding is a dark color, you can use a piece of masking tape over the section being cut. This way you can still use your carpenters’ pencil to mark a line and it will be easy to see. Set your siding on your workbench making sure the part being cut is hanging off of the edge. Check under your bench to ensure nothing is under the line you are cutting. Try using a couple planks of wood under the siding so you can elevate it as you cut. Use the circular saw to slowly cut along the marked line. Be sure that you are pushing the saw firmly and at a consistent rate to get a smooth and beautiful cut. Keep your eyes on the saw to make sure you are following the line precisely. Using your free hand, you can hold the vinyl siding in place to avoid shifting while cutting. Before you start your cutting, be sure that you are equipped with your safety goggles and gloves. Once it’s time for you to begin putting your vinyl siding on the house, it’s still important to pay attention to detail. Be sure not to cut corners on small materials like nails and trim. It could cost you your whole project. Always remember that with self-installation, comes risks. The easiest way to ensure a perfect siding job is to call your local dependable experts at Legacy Service. Based in Pennsylvania, we’ve been at the top of the market for years and will always be dedicated to providing you with the highest quality exterior work. Give us a call today to receive a hassle-free and transparent estimate on your next siding project.